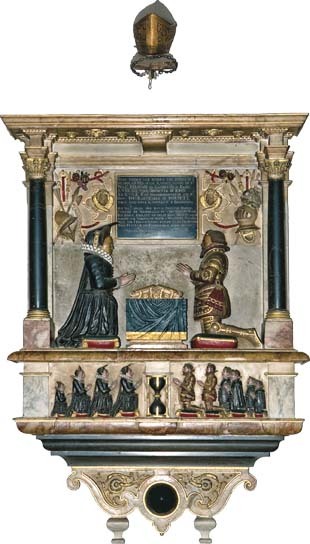 Sir Nicholas Pelham (d.1559) and his wife, Ann (née Sackville) are depicted on a splendid Renaissance memorial on the north wall. They are shown kneeling facing each other in prayer with their ten children as mourners below. The inscription commemorates Pelham’s defence of Seaford in 1545 against a French expeditionary force which had previously burnt the village of Brighthelmstone (Brighton today). It contains a pun on the name Pelham.